Semtech Corporation (Nasdaq: SMTC), a leading supplier of analog and mixed-signal semiconductors, will demonstrate eight 1.5G serial digital interface (SDI) signals transported across a single 12G SDI coaxial cable link utilizing its GS12070 Gearbox at the International Broadcasting Convention (IBC) exhibition, stand 10.F46, on September 9-13 in Amsterdam. The ability to transport up to eight 1.5G HDTV SDI signals across a single 12G link adds additional capabilities to facilities with 12G SDI infrastructures by simplifying the routing and distribution of multiple 1.5G HDTV signals. Rather than utilizing up to eight discreet coaxial links, 12G link concatenation exploits the massive bandwidth available in a single 12G link to transport up to eight 1.5G SDI signals. The 12G concatenated link conforms to The Society of Motion Picture and Television Engineers’ (SMPTE) proposed ST 2082-30 12G SDI link concatenation standard. Link concatenation utilizing SMPTE’s proposed standard can significantly reduce infrastructure complexity and cost without additional risk of interoperability issues in a facility that supports multiple data rates, including 1.5G, 3G, 6G, and 12G SDI. The demonstration utilizes Semtech’s GS12070 Gearbox. The GS12070 is the industry’s only single chip SDI link concatenation and rate conversion solution that enables equipment manufacturers and broadcasters to take a standards-based, commercial, off-the-shelf approach to UHDTV infrastructures. 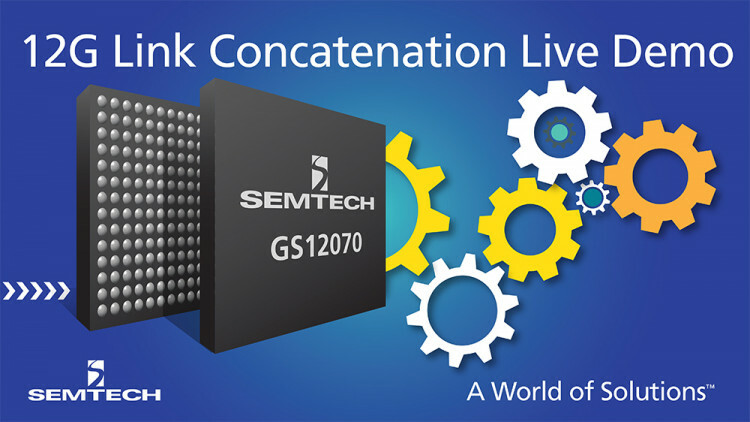 Link Concatenation: Supports SMPTE’s proposed ST2082-30 12G link concatenation standard facilitating multiple 1.5G, 3G, 6G SDI signals across a single 12G link. Fully integrated gearbox solution: Four-input and four-output ASIC supporting conversions between multi-link, dual-link and single-link UHD-SDI interfaces. Automatic skew correction: For multi-link inputs, automatic compensation for channel skew—an unavoidable system challenge in multi-link UHD-SDI systems—that exceeds the SMPTE’s recommended skew tolerance specification. This minimizes the need for additional system resources and simplifies the overall system design. Integrated 4x4 crosspoint switch: Enables signal routing by selecting from any of the four 12G UHD-SDI inputs to any of the four 12G UHD-SDI outputs making it an ideal choice for UHDTV routing and distribution applications. In addition, any of the active outputs can be copied to unused outputs. Automatic link ordering: Automatic link ordering for multi-link interfaces simplifies integration and automatically compensates for UHD-SDI cabling issues that often arise during installation. The GS12070 will be available for sale the second half of 2016. Semtech offers comprehensive design assistance, including field- and factory-based support. Data sheets, volume pricing and delivery quotes, as well as evaluation kits and samples, are available at www.semtech.com/info. All statements contained herein that are not statements of historical fact, including statements that use the words such as “will” or other similar words or expressions, that describe Semtech Corporation’s or its management’s future plans, objectives or goals are “forward-looking statements” and are made pursuant to the Safe-Harbor provisions of the Private Securities Litigation Reform Act of 1995, as amended. Such forward-looking statements involve known and unknown risks, uncertainties and other factors that could cause the actual results of Semtech Corporation to be materially different from the historical results and/or from any future results or outcomes expressed or implied by such forward-looking statements. Such factors are further addressed in Semtech Corporation’s annual and quarterly reports, and in other documents or reports, filed with the Securities and Exchange Commission (www.sec.gov) including, without limitation, information under the captions “Management's Discussion and Analysis of Financial Condition and Results of Operations” and “Risk Factors”. Semtech Corporation assumes no obligation to update any forward-looking statements in order to reflect events or circumstances that may arise after the date of this release, except as required by law. Semtech and the Semtech logo are registered trademarks or service marks, of Semtech Corporation and/or its affiliates. Third-party trademarks or service marks mentioned herein are the property of their respective owners.